The man in charge of Rotherham United’s first game back in the Championship against Brentford at Griffin Park will be Oliver Langford from the West Midlands. The last time he was in the middle of a Millers game was in February 2017 at the New York Stadium in the Championship game against Blackburn Rovers. The game was a one-all draw with Jon Taylor scoring for the hosts but an own goal five minutes from time from Stephen Kelly gave Rovers a point. Earlier that season Oliver was also in charge of our game at Pride Park which Derby County won three-nil. The time before that was in March 2015 when Sheffield Wednesday were at the New York Stadium. Ben Pringle opened the scoring for the hosts on fifty-seven minutes with an equaliser on eighty-six minutes coming from Caolann Lavery. Just a minute later Jordan Bowery, with what was probably his first touch after coming off the bench, put the Millers back in front but just as the Fourth Official put the board up for an extra seven minutes Atdhe Nuhiu got a second equaliser for the Owls. Then, to make matters worse, on the eighth minute of the seven allotted the Millers defence fell to sleep and Kieran Lee hit the winner for the visitors. That afternoon Jack Hunt and Craig Morgan was booked for the Millers plus Owls players Joe Mattock and Sam Hutchinson. October 2013 saw Oliver in the middle for our one-nil win over Brentford at Griffin Park. Mark Bradley scored the Millers goal on fourteen minutes with Mr Oliver deeming to book six Millers players – Bradley, Lee Frecklington, Rob Milsom, Ben Pringle, Alex Revell and Kieran Agard – and Alan McCormack from the Bees. On Easter Monday of that same year Oliver took charge of our game at the Priestfield Stadium which saw Deon Burton score the only goal of the game for Gillingham. Last season Oliver was in the middle for thirty-nine games showing one hundred and twenty-one yellow cards and five red cards. 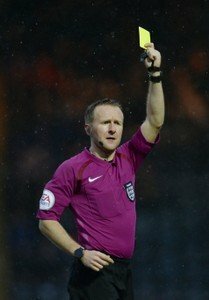 Ian Cooper from Kent and Sam Lewis will be running the line at Griffin Park with the Fourth Official being Robert Jones from Merseyside who reffed our League One Wembley Play-Off Final in May.